If your bin has lost a wheel, has a broken lid, or is damaged in anyway report a bin issue so that we can repair or replace it. You can also report a missed waste service, bin spillage or a missing bin. Once your request has been submitted, please put your bin out so we are able to attend to it. 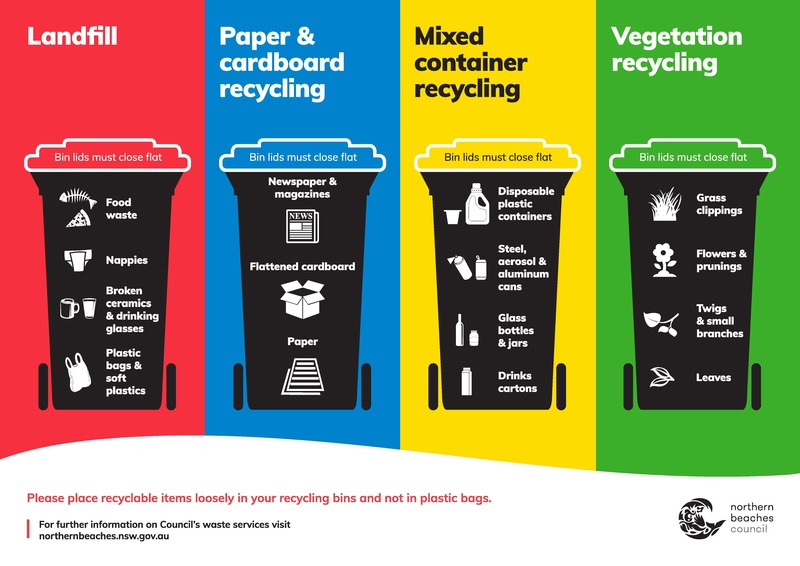 It’s easy to separate recycling and keep it out of landfill when you know exactly what waste should go into each of your colour-coded bins. All plastic, metal and carton containers, glass bottles and jars from the kitchen, bathroom and laundry, including small plastic plant pots, plastic meat trays and fruit punnets, even without recycling symbols. No plastic bags, cling wrap, polystyrene, ceramics, white glass (like Malibu bottles), flat glass or furniture or toys. For clean paper and cardboard only, including glossy magazines and shredded paper. Please flatten boxes and crumpled paper if you can. No food, wax-coated cardboard or soiled paper. For these, please use your red or dark green garbage bin. For garden waste like leaves, branches less than 75mm thick, dead flowers, grass cuttings and other vegetation that can be mulched. No tree stumps, logs, trunks, soil, bricks, plant pots, tiles, stones or concrete. Vehicles are limited to cars, station wagons, utes, family vans or trailers with up to 300kg of vegetation. Proof of residency, ie Northern Beaches Council sticker, driver's licence or rates notice is required. No trucks or other vehicles are allowed. However arrangements can be put in place to register a trade vehicle for a resident's own occasional use. Please see Kimbriki reception for details. Vehicles are entitled to one vegetation drop-off on any given day. If your load is over 300kg you must pay the full amount not just the portion you are over. We understand you don't weigh your vegetation when loading so some leeway will be given for loads close to 300kg. The NSW EPA requires that all waste entering Kimbriki must be accurately accounted for. Dividing weighbridge transactions once completed adds complexity, time and cost and consequently is prohibitive and cannot be accommodated. For general household garbage we can’t recycle, including wax-coated cardboard or soiled paper, plastic bags, cling wrap, polystyrene and ceramics. Bag lightweight waste like sawdust, dust or ash or seal it in a container so it can’t blow around. No building materials, liquids or hazardous waste. Contact Customer Service on 1300 434 434 for more information. To help educate about separating waste and recycling, we provide free resources for unit blocks and households. Residents may collect weatherproof posters for unit blocks and bin stickers for both unit blocks and households from Council's Customer Service Centres. Alternatively you may wish to download and print your own poster if your bin bay is under shelter. Don't forget to set your printer page size before printing.